Gravity casting is the most economical way to mass produce NASA pistons. When using this method, the molten material is poured into a metal mold and solidifies in the mold. In particular the composition and the fluidity of the alloy as well as the alloy's solidification determine the quality of the piston. PAC/Rightway have further advanced the NASA aluminum alloy technology by developing a innovative gravity die casting process that greatly increase the fluidity of molten aluminum. This innovative casting process enables thin-walled piston production for weight reduction. 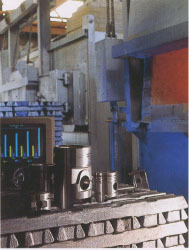 Squeeze casting, also termed liquid metal forging, is an advanced casting technique that enables fast cooling and free of gas entrapment in the die. During squeeze casting, molten aluminum is squeezed in a controlled fashion under high pressure to complete the filling of the die. The fast cooling rates can refine microstructure and greatly improve fatigue resistance and wear resistance. Using this method it is thus possible to produce heat-treatable pistons that have much improved fatigue strength and fracture toughness than gravity cast pistons. Another advantage of squeeze casting is the possibility of using preforms (high-porosity bodies made from specially selected materials). By infiltrating these performs with molten metal under high pressure it is possible to further improve the properties of the aluminum castings and create extremely hard-wearing working faces. Most forged aluminum pistons are predominately made from 4032 aluminum alloy to allow for tighter cylinder to wall clearances, and improved temperature stability. 4032 alloy lacks high temperature strength and suffers dimensional instability that results in drastic drop in engine performance and efficiency. Some applications use 2618 alloy, which is a significantly stronger alloy than 4032 at elevated temperatures. However, 2618 alloy has very thermal expansion that causes considerable noise and vibration during cold start. The use of patented NASA alloys to manufacture forged pistons offer unmatched advantages over both 4032 and 2618 by providing high temperature strength, low thermal expansion and exceptional were resistance and durability.